Nutren® 1.0 Fiber Complete Liquid Nutrition with Fiber is a ready-to-use tube feeding formula that includes fiber and is rich in vitamins and minerals. This complete source of nutrition is for short or long-term tube feeding. Comes in 250 mL (8.45 ounce) cartons. This nutritious liquid tube feeding formula is perfect for those with normal protein and calorie needs. The fiber glen helps support digestive health and normal bowel function. Nutren 1.0® Fiber offers 100% of 20 key vitamins and minerals and also contains taurine, carnitine, and ultra-trace minerals for long-term feeding. 25% of fat content is NCT-oil, a special fat source that is easy to absorb. 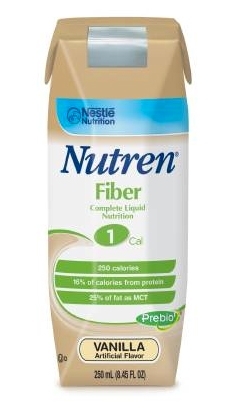 Nutren® 1.0 Fiber contains 14 grams of fiber including PREBIO1TM fiber blend to support digestive health and normal bowel function. Supplies 5.2 gram soluble and 8.8 grams insoluble fiber/L. PREBIO is a soluble fiber to help promote the growth of beneficial bacteria and insoluble fiber to help support normal bowel function. Vanilla flavored and can be used for tube feeding or as an oral supplement. Appropriate for lactose-intolerance*, gluten-free and kosher. Provides nutritional support for bowel function. This is a medical food intended for use under medical supervision. It is not intended to diagnose, treat, cure or prevent disease. (Vanilla): Water, Maltodextrin, Calcium-Potassium Caseinate (from Milk), Corn Syrup, Sugar and less than 2% of Canola Oil, Pea Fiber (Insoluble Fiber), Medium Chain Triglycerides (from Coconut and/or Palm Kernel Oil), Corn Oil, Fructooligosaccharides (Soluble Fiber), Artifical Flavor, Soy Lecithin, Potassium Citrate, Inulin (Soluble Fiber from Chicory), Salt, Sodium Phosphate, Calcium Citrate, Magnesium Chloride, Choline Chloride, Potassium Phosphate, Citric Acid, Sodium Ascorbate, Magnesium Oxide, Carrageenan, Sodium Citrate, L-Carnitine, Taurine, Alpha-Tocopheryl Acetate, Dextrose, Zinc Sulfate, Ferrous Sulfate, Niacinamide, Calcium Pantothenate, Vitamin A Palmitate, Manganese Sulfate, Color (Turmeric Extract), Pyridoxine Hydrochloride, Copper Sulfate, Riboflavin, Vitamin D3, Thiamine Mononitrate, Folic Acid, Biotin, Sodium Molybdate, Potassium Iodide, Chromium Chloride, Sodium Selenate, Phytonadione, Vitamin B12.